By finding out more about the extensive capabilities of the XJTAG boundary scan test system, which delivers benefits to prototype development as well as production testing, KERAjet of Vila-real in Spain is reaping the rewards of a sharper focus on DFT (Design for Test) in the early stages of board design. 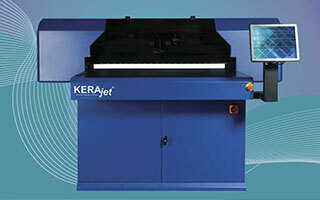 The KERAjet P-140 or K-700/710 printers are four-colour machines capable of printing the complete image in a single pass. To manage the process, each inkjet printhead has its own dedicated controller board built around an FPGA featuring an embedded processor. Other circuitry includes A/D and D/A converters, SDRAM and Flash memory, and an Ethernet PHY chip allowing the board to communicate with the printer’s main processor. Some printers may use up to 60 of these boards to apply the four-colour process over the full printable width. To ensure a means to test the connections of the FPGA’s BGA I/Os and other devices, which cannot be probed using conventional in-circuit test equipment, KERAjet engineers chose to use boundary scan testing. In practice, many other devices are connected to the JTAG chain, as well as the FPGA. This has significantly increased the test coverage that the team can achieve using boundary scan. As a further benefit, KERAjet is able to work closely with its manufacturing partner Celestica, which uses the XJRunner system from XJTAG to test production boards. XJRunner is a run-time environment system optimised for production. This continuity between development and production eases new product introduction and shortens time to market. Celestica is using XJRunner to check every board ­­­after the soldering process, to identify defects that sometimes cannot be detected by conventional optical inspection. Boundary scan testing has proved to be a powerful technique, which has not only enhanced our test capabilities but has also influenced our design processes allowing us to achieve higher testability and reliability. The XJTAG system delivers outstanding value, combining powerful capabilities with ease of use through features such as the clear GUI, XJEase programming language and the device-centric philosophy that aids test generation. XJTAG’s built-in DFT features have proved particularly valuable by allowing us produce a detailed DFT analysis at the click of a button even before hardware is ready. We can design for very high levels of testability. KERAjet® España produces specialised inkjet printers capable of applying digital artwork directly to ceramic tiles. With major customers in the European ceramic heartlands of Spain, Portugal and Italy, KERAjet also exports to tile producers worldwide. The company’s engineering teams are using the XJTAG boundary scan system to aid with design and test of the controller boards for its printers, and cites increased reliability and testability as two major advantages of incorporating the system into its processes.